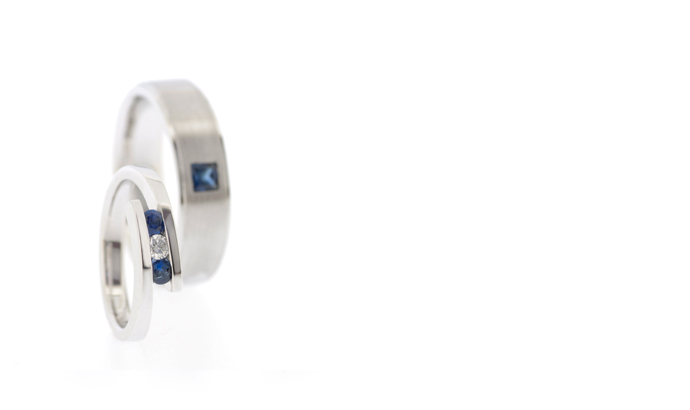 Since we make most of our wedding rings Matching rather than identical, there are enough examples of rings with Blue Sapphires to get a post of their own. The Sapphire is often used as a symbol of fidelity, which makes it a popular gemstone in wedding jewellery. Hers with Infinity signs full circle with a ‘lacy’ look. His was made more masculine with a solid band as a base. Both with one small Sapphire. Two completely different designs, but the Blue Sapphires make this an obvious pair. Wedding Anniversary Rings in 18K White Gold. Her Sapphires are accompanied by Diamonds. His Sapphire is hidden inside.